ARR is not the first music director I loved …. rather I was yet to like any music composer independently till he arrived. In my first post I did mention that I enjoyed listening to Maine Pyaar Kiya and Jo Jeeta Wohi Sikandar during that phase … I also had a compilation of some old hindi songs and Marathi Natya Sangeet … It would be fair to say that my dad played a big role in shaping my musical tastes … Its interesting to see how vehemently we differ from each other today when it comes to our musical choices …. But I have a very sharp ear for music and i can comfortably call myself a Kansen … Much of the credit goes to my dad … because not only he introduced me to some good music but being a sound engineer acoustics expert himself he introduced me to the science of sound …. He taught me how any song comprises a spectrum of sound frequencies … what are tones …. what are harmonics … Why a tabla sounds different from a Pakhwaj …. and I started listening to all sounds around me with that lens … and yes there is music in every sound …. nothing is noise according to me … with today’s softwares I am sure wizards like ARR and Salim Sulaiman can even create songs out of cacophony recorded in fish markets … In hindsight now I understand that I was looking for music that was fresh and enchanting in sound in that phase. We say music is made of Sur (Melody) and Taal (Rhythm) …. But I think the third dimension Naad (Sound) is equally important too …. And that is the most natural approach to music …. afterall we as pre historic human beings were being exposed to a variety of sounds ….. I went to meet my composer friend Bunckim …. who is another avid Rahmaniac …. to discuss Rahman’s sound …. and then this discussion moved a bit away from the pure idea of sound …. We realized that though ARR’s music has a distinct production and sound excellence …. these are not standalone features of his music …. they are beautifully blended in his music just like all the masala tempering and vegetables get blended in hot aromatic sambar …. ARR is not just a great composer ….. he is a great human being …. someone who has respect for music and musicians … someone who is extremely passionate and honest … and this purity of passion gives one a courage to break rules … He is a rebel …. a musical storm …. but he has a sense of purpose in breaking rules …. Though I am a great Rahman fan I must admit that many of his sound qualities we admire have come from the west …. they had to hit indian shores some day …. But ARR did not wait for that to happen …. He wanted his music to sound refined and he worked on that …. Having a great pillar of support like late H Sridhar also worked in his favour …. today we all know that Rahman sound is refined at the state of the art Pnachathan, A M Studios and abroad when needed …. but even when he had a limited budget his sound quality was par excellence …. He can use all the latest techno sounds along with some exotic acoustic instruments with amazing ease … Pachai Nirame is one apt example of this …. His songs usually cover a big spectrum of frequencies …. 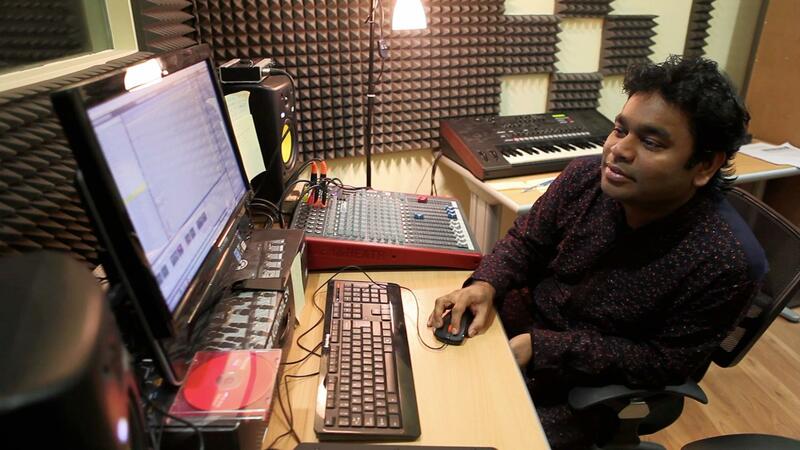 People tend to focus on bass while designing sound … But Rahman’s songs are more complete in that sense …. listen to Chinna Chinna Asai … Keith Peters has played very catchy bass guitar sequences in that song …. at the same time it has high pitched fillers, bell sounds, sounds somewhere in the mid range …. and the most exciting thing is each thing is sharp vivid and crystal clear … His music is HD Tv …. All the sounds he uses have a balanced presence and hence he is able to make the most of human ability to grasp big range of sound frequencies simultaneously …. listen to Hum hain is pal yahan from kisna …. how clearly you can hear and enjoy kick of the rhythm, cello pieces in harmony and the bass …. and all these three elements dont get smudged up …. probably thanks to Sridhar sir …. He is a complete composer …. He composes melodies, arranges them and according to sound moguls like H Sridhar and Resul Pookutty he is himself a good sound engineer …. which means sound, orchestration and melody in his music go together …. they are composed and visualized in harmony …. unlike other composers who just make melodies and ask their arrangers and engineers to do the rest ….